DOVER-FOXCROFT — Dave’s World of Dover Foxcroft is well known throughout Maine. Perhaps it is because they have become the national leader in heat pump sales, or because they have experienced incredible growth since they’ve opened their doors, creating jobs and boosting the economy in our region. Some might say it is because of the unique television commercials you can’t stop hearing after you watch them — you know, “Dave’s World – AWESOME!” – or because everywhere you look, you happen to see a Dave’s World van. Or maybe it’s because, with each passing year, they find a way to offer new products and services needed by our local communities, eliminating the need to leave the county to get them, and keeping dollars local. It could just be their customer service- or as the Dave’s World team likes to say, their ‘legendary’ customer service. Dave’s World has offered in-house, complete kitchen and bathroom remodels for many years, and has also successfully provided professional custom design, product ordering & installation, and project management services to contractors on new construction for both residential and commercial projects; however, the prior set up at Dave’s World did not effectively represent those services. 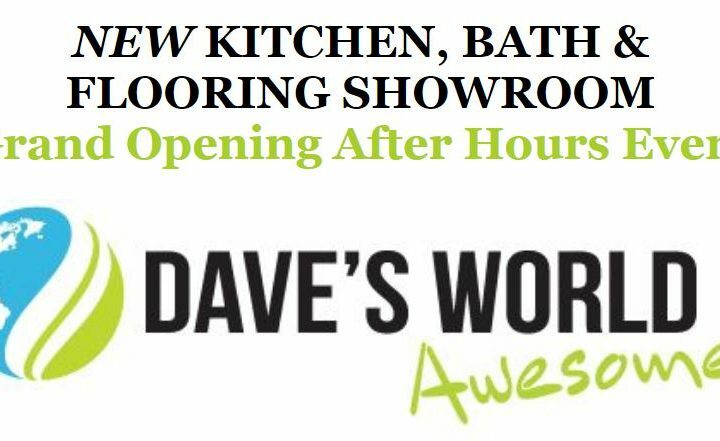 Today, when customers experience the new showroom, they will have a more complete understanding of all Dave’s World has to offer, both in product and quality craftmanship. The new Kitchen, Bath, and Flooring Showroom gives customers a feast of options, styles, and colors to choose from – for every budget – from cabinets, to countertops, to backsplashes and flooring of all types; now customers can see and feel the product before making a purchase. The Dave’s World team is excited to reveal the new showroom to our local communities. Piscataquis Chamber will hold a showroom grand opening 5:30-7:30 p.m. Thursday, June 14, for chamber members and the community to experience the new showroom for themselves. Guests can expect to find refreshments, including hors d’oeuvres and a cash bar, and great door prizes.